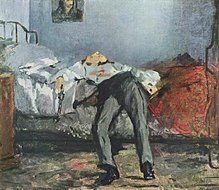 Suicide (Latin suicidium, from sui caedere, "to kill oneself") is the act of a human being intentionally causing his or her own death. Suicide is often committed out of despair or attributed to some underlying mental disorder. Financial difficulties, troubles with interpersonal relationships and other undesirable situations play a significant role.— Excerpted from Suicide on Wikipedia, the free encyclopedia.